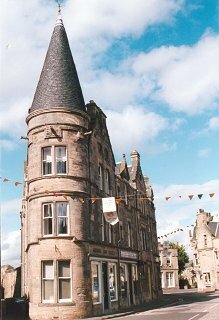 A town in Falkirk Council area, situated on a nose of land jutting into the Firth of Forth, Bo'ness is short for Borrowstounness - the Burgh Town on the Ness. Recognised as a port in 1601, it became one of Scotland's leading ports in the early 18th Century when the customs house was moved from nearby Blackness. It exported coal and slag to the Low Countries and Scandinavia and imported timber from the Baltic and clay and flint from Devon and Cornwall for use in Dr John Roebuck's Bridgeness pottery. The town also developed as a prosperous ship-building, whaling and fishing port, its inhabitants being known as 'Garvies', a local name for sprats. Buildings of interest include Kinneil House, Bo'ness Town Hall (1904) and Bridgeness Tower which was formerly a windmill and an observatory. Part of the Roman Antonine Wall known as Graham's Dyke passes through the town, which now incorporates the districts of Corbiehall, Castleloan, Deanfield, Maidenpark, Kinneil, Borrowstoun Mains, Borrowstoun, Newtown, Grangepans, Grahamsdyke, Carriden and Bridgeness. Bo'ness Children's Fair Festival (The Fair) dates from the 18th C. and takes place annually at the end of June. This involves the crowning of a Queen together with the remarkable the transformation of individual homes into elaborate fairy-tale palaces. The Scottish Railway Preservation Society operates the Museum of Scottish Railways in the town and also runs steam-hauled trains on the Bo'ness and Kinneil Railway which stretches for 3½ miles (5.5 km) from Bo'ness to Birkhill Fireclay Mine, where 300 million year old fossils can be seen in underground tunnels.